Tara finds that having two younger daughters in addition to Abby, nap time is our primary block to accomplish school. Abby and I were able to complete a lesson, along with her other subjects, during nap time without being rushed or stressed. I was able to spend quality one on one time with my kindergartner. If for some reason our schedule was off, we could easily include a curious toddler and newborn. It worked well in either scenario. Summer (who just turned 2 in July) was just as eager to learn and explore as Abby. During our unit study on plants, I asked my husband’s aunt to join us for one particular lesson. She’s an excellent gardener and Abby loves her dearly. We also asked Abby’s cousins (ages 4 and 7 at the time) to join. They enjoyed the lesson as much as Abby! 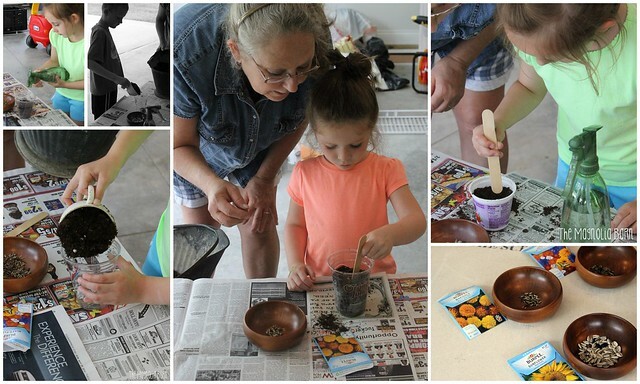 Tara of The Magnolia Barn tells us about using the Science K kit with her daughter. In November, Abby began Kindergarten. While I had determined most of her curriculum, I was however, unsure about science. As a new homeschooler, while confident in my decision, I am not as confident in my abilities to pull together my own science lessons and be consistent in that department. At the time, our family had many upcoming events (new house construction, expecting a new baby) taking place simultaneously, I needed a curriculum that was easy to use, completely planned and ready to go…enter Nancy Larson Science. When we began using the program, I was amazed at how easy and fun the lessons were. With a busy toddler in tow and a newborn, school had taken a backseat while we adjusted. But, we found Nancy Larson Science K to be an easy addition to our day. I appreciate the scripted dialogue and games presented during the lesson. I feel that I can thoroughly and effectively teach her with the guidance provided by the teacher’s manual. 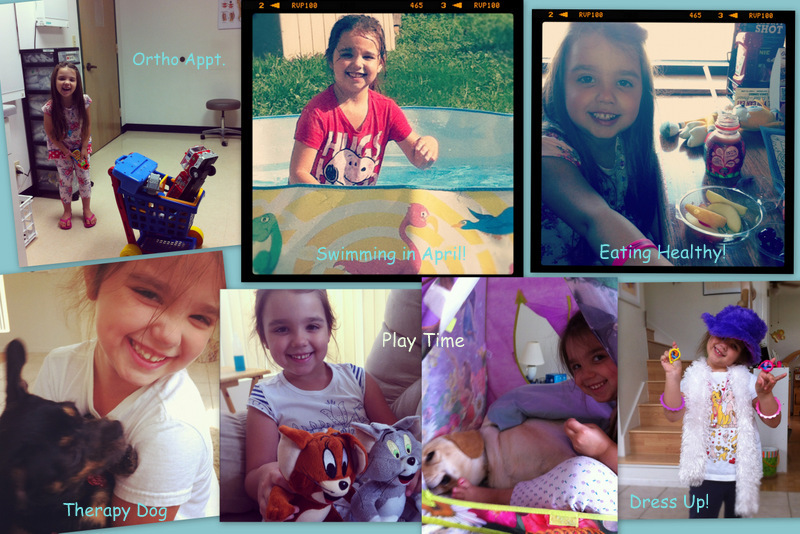 Abby is able to learn a manageable amount of information and stay engaged the entire time. She’s a very active, hands-on little girl and this is perfect for her!One of her favorite parts so far has been reviewing with the help of playing Simon Says. I love seeing her smile and enjoy what she is learning. The lessons are perfect for busy, homeschooling moms! While I try to be organized and have my lessons and materials planned and ready, life happens. Nancy Larson Science makes it easy! When things got hectic and I was not prepared, it was not a big deal. I was able to quickly gather the needed materials listed for the lesson, even when I was short on time. The scripted lessons offered a starting point to get my child engaged. As I became more accustomed, I felt more comfortable adding in more discussion that related personally to my child. The lessons are short, yet full of hands-on activities to keep even the most active child’s full attention. Nancy Larson has taken the stress and pressure off of me and provided an exciting learning experience without sacrificing time! 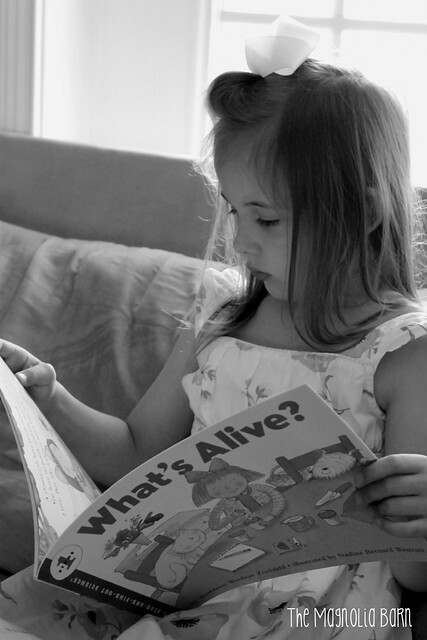 Elizabeth creates printables for young learners and writes at Creative Learning Fun. She uses Nancy Larson® Science K with her daughter Pumpkin. Below is her latest update. We are chugging along with the Nancy Larson Science K curriculum. A couple of months ago you might have read my review for this curriculum. If you missed it, you can see it here: My Nancy Larson Science K Review. We are still loving it just as much as we did when we started. I honestly cannot say enough wonderful things about this curriculum. For the past two weeks we have been talking about characteristics of pets. So far, this section of the curriculum is Pumpkin’s absolute favorite. Every time we start our school day, she checks her boxes to make sure I’ve included a science lesson. I am so impressed with how much Pumpkin is learning from this curriculum. 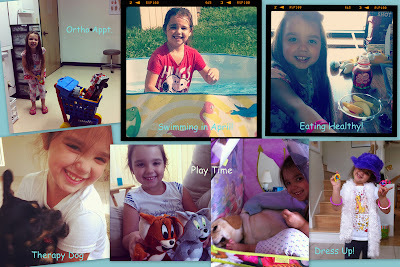 So far we have learned about our five senses, how to keep our bodies healthy, and about pets. For this unit, it was suggested within the curriculum that I put together a veterinarian pretend play box for Pumpkin to explore. Pumpkin absolutely loved this part! I put some of her doctor kit supplies in a box, a measuring stick, a soft pillow and blanket for her patients, and a food bowl and baby bottle. Since Pumpkin struggles with pretend play, I took it as an opportunity to teach her using scripting and imitation skills. I would bring her a stuffed animal that was “sick.” I’d say something like, “oh poor baby, this kitten has a fever and his nose hurts.” Pumpkin would immediately get to work fixing the kitten up. Since he was a good kitten, he was awarded with a “treat” and a sticker on his nose. 🙂 Our real dogs even jumped into pretend play and played along. Here is a video of me asking her to explain to me the different characteristics of one bird. The bird puppet is from a book titled, “Alphabet Puppets plus more” by Teacher’s Friend Publications. Then she did a little booklet that is from the Mailbox Companion. If you are looking for a science curriculum for next year, I highly recommend you check out Nancy Larson’s homeschool science programs. She has five different programs for ages 5 to 12. The program we are currently using is the Nancy Larson Science K program. Even though Pumpkin will be enrolling in a school next year, we will continue to use the Nancy Larson science programs at home as part of our afterschooling program. It’s such a fun curriculum! Feel free to ask questions in the comments. You are also welcome and encouraged to contact Madon Dailey if you have more specific questions about the curriculum. Disclaimer: The product in this review was provided to me for the purpose of conducting a review. However, all opinions are solely mine and are not influenced in any way. Recently Elizabeth who authors Creative Learning Fun posted about our Science K program. This is the first year that we’ve really dived into learning Science. Several months ago I became aware of this brand new curriculum created by Nancy Larson for kindergartners. This curriculum was created for children between the ages of five and seven years old. I decided to hold off until Pumpkin was five years old, although it was very difficult too. The curriculum always looked so cool! Thankfully, our wait is now over and we’re thoroughly enjoying Nancy Larson Science K.
The Nancy Larson Science Homeschool program is available to not only kindergartners. There are also three other levels of curriculum for older children as well. The first level focuses on Life Science, the second level focuses on Physical Science and the third level focuses on Earth and Space. The levels increase by grade and age levels. However, the age ranges for each level is pretty wide so using one level with children close in age would work well. Identifying Seasons and Weather Conditions – Earth and Space. The kindergarten curriculum combines life, physical and earth and space science into an excellent curriculum. The Science K curriculum kit comes with a Teacher’s Manual, Student Materials, Resource Materials, and a Tool Kit. The tool kit includes basically everything you would need except for small things you would have around the house already. The materials are meant to be used with one child. However, you can purchase extra materials for $15.00 for each additional child. Another great feature is that on request the Nancy Larson Science Homescool company will send you a list of supplemental books that go along with each curriculum. The books have been carefully selected for age appropriateness and the availability of the books at most libraries. These books certainly are not required, but I have found that Pumpkin is always asking for more science. So these books offer even more exposure to the topics being taught within the curriculum. The teacher’s manual is also really amazing. It lays out each lesson completely for the teacher. The thing I love the most is that it is scripted for you. You don’t have to come up with what to say or the appropriate way to word something so your child will understand. It makes it so much easier! Homeschooling is challenging enough as it is, such this added feature is very much appreciated for this homeschooling momma. Another wonderful thing that I love about this curriculum is how quickly Pumpkin learns from it. After lesson one she had already picked up science vocabulary that I never would have thought she would remember. Such as the word “observe.” After lesson one she was already incorporating that word into her every day conversation. Additionally, the curriculum kit includes extra resource materials for you to use. The resource cards are very colorful and I’m thankful to have them pre-printed for me. The teacher resource CD contains additional pictures you can use, as well as literature connections, glossaries and other materials that can be used if needed. There is also a Fitness Fun CD included which is very nice to have. My daughters favorite part is the weather wheel that was included. We had to put it up immediately and she kept telling me she loved it. Now every day she goes up to it and changes it even before I remember to. In addition to the great teacher’s manual, your student also gets their own student materials. The Science K curriculum includes several student booklets and activity sheets that help to highlight important components of the topic they are studying. They can then do their own drawings and record their own answers into the booklet about what they have learned. There are also three very cute books included in the program to further your child’s understanding of certain topics. I’ll be sharing this curriculum even more coming up soon. Be sure to subscribe or “like” me on Facebook so you don’t miss out! Elizabeth of Creative Learning Fun updated her review of Science K, including a wonderful video Dancing to Science K.
We finished up talking about our senses and then moved on to talking about ways to keep our bodies healthy. The curriculum comes with this really fun fitness CD that Pumpkin LOVES! We did the first two songs this week and Pumpkin has a blast. It’s also really hilarious to watch her try to do jumping jacks during the second song. Her drawing in the booklet. She is jumping on a trampoline. She is still loving the foam blocks too! My daughter having fun with her science curriculum! Such a busy week, but tons of fun! I hope you had a wonderful week too!